Combine dry ingredients, pulse twice in a food processor. Return to bowl and place 1 stick of butter cut into ¼ inch pieces on top. Use your hands and incorporate the butter into the dry ingredients. Add cold water as needed. Add remaining butter and mold into ball. Refrigerate for at least 2 hours before rolling out and baking. 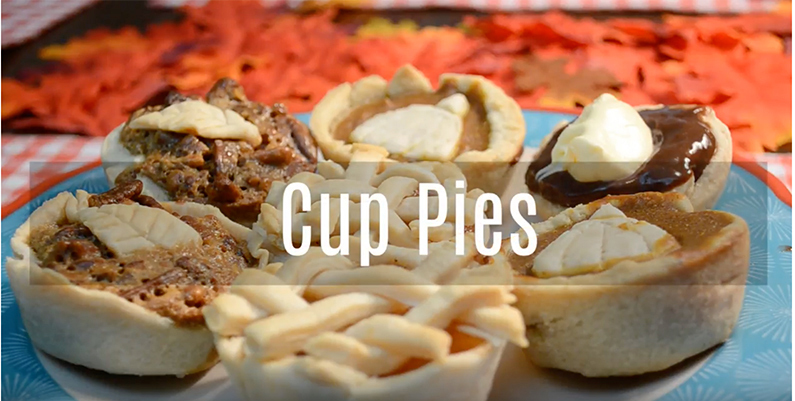 Each filling recipe makes 12 cup pies. Make sure all egg is incorporated into mixture before baking. Melt butter in a pan over low heat, mix in sugars. Mix together eggs, milk, flour and vanilla in a separate bowl. Combine both and add chopped pecans making sure to coat all in the mixture. Peel, halve and core the apples. Cut them into desired size slices. Toss apples with lemon juice, add the sugar and toss to combine. Add the apples and cook, stirring until the sugar dissolves and the mixture simmers. Cover and reduce heat – let the apples cook until they are soft and release their juices. Strain the apples and return them to skillet to simmer over medium heat until thickened and caramelized. In a large bowl, mix pudding mix and milk until completely combined. Pierce the crusts with fork before baking. Let the crust cool completely before adding the chocolate mixture and topping with desired toppings.